↑ Original Term until December 30, 1973 cut short pursuant to the Declaration of Martial Law on September 23, 1972. ↑ Leonard, Thomas M. (2006). Encyclopedia of the developing world, Volume 1. ↑ Lentz, Harris M. (1988). Assassinations and executions: an encyclopedia of political violence, 1865–1986. ↑ "Benigno Simeon Aquino, Jr.". Encyclopædia Britannica. ↑ Jessup, John E. (1998). An encyclopedic dictionary of conflict and conflict resolution, 1945–1996. ↑ Soliven, Maximo V. (August 26, 2008). 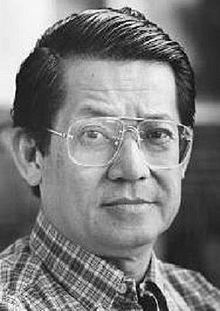 "Ninoy: In the Eye of Memory" ওয়েব্যাক মেশিনে আর্কাইভকৃত ২৩ মার্চ ২০১১ তারিখে. Assassination of Benigno Aquino, Jr.
"Maka-Diyos, Maka-Tao, Makakalikasan at Makabansa"